From The Weekly Standard. September 22, 2014. Let’s face it. Should Rebecca Mead, a New Yorker staff writer, offer us her mere, unadorned autobiography as something to pack along with our pail and shovel as a good beach read, she might risk the odd sarcastic comment from a friend or accusations of presumption or arrogance from those less well-disposed toward her. And yet, she’s proud of her life and has the professional writer’s urge to share. What to do? Well, one answer is to hitch the memoir to somebody else’s star, somebody of indisputably autobiographical stature. The result is the latest example of that new genre, "part literary criticism, part memoir," that Elaine Showalter calls "the shelfie." It may not top the commercial success of Elizabeth Gilbert (Eat, Pray, Love) in turning her less-than-distinguished life story into a celebrity memoir and self-help guide for women, but then what does? George Eliot, née Mary Anne (or Mary Ann or Marian) Evans, is Mead’s choice of eminent author whose life may be said to shadow her own. Rebecca Mead, too, was a bookish girl from provincial England, not conventionally pretty but not without her charms for men. She has enjoyed success as a writer in the metropolitan center of the English-speaking world of her day and, on her marriage, became a sudden stepmother to three sons, just as Eliot did to the sons of George Henry Lewes. Such frequently cited parallels give Mead the advantage of self-help at second hand, since George Eliot’s life experiences made her very big on wise sayings and how-to-live advice — perhaps even bigger than she was on writing readable novels, though that is clearly a matter of opinion. Profound, don’t you think? Mead certainly does, finding in it evidence of the author’s opinion that "if Art does not enlarge men’s sympathies, it does nothing morally." Mead’s own sympathies, like those of most readers, vibrate in tune with the sorrows of the novel’s marriage martyrs, Dorothea and Lydgate. "I am able," Mead claims, "not only to imagine their vivid, solipsistic experience but also to see them from Eliot’s authorial perspective of heightened, mature sympathy. In viewing them I am invited to shed my wadded layers of stupidity, and to listen for the sound of growing grass." Unfortunately, she does not tell us what she hears when she listens for the sound of growing grass, but we can be pretty sure it’s not growing grass. Nor, presumably, has she successfully shed her wadded layers of stupidity, since doing so — according to George Eliot, anyway — would have resulted in her death. 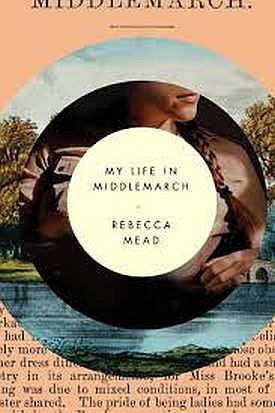 In other words, Rebecca Mead turns out to be not that careful a reader of the one book she says gives meaning to her life. What she takes to be a recommendation for infinitely expansive sympathy is actually a warning of sympathy’s limitations, even in "the quickest of us." And although we may stipulate that Mead knows something of "vivid, solipsistic experience," this does not mean the word "solipsistic" is appropriate to describe the experiences of the novel’s characters. She is projecting her own solipsistic experiences onto them, as she does throughout this book. How touching, this modest attempt to reclaim the common reader’s "we" from its political and academic exile! She is likewise self-deprecating in her account of her (albeit long dead) rival for the position of Eliot’s acolyte, whose name, like her own, is only four letters long and begins with the letter "M." In 1875, Alexander Main produced, with the author’s permission, a volume titled Wise, Witty, and Tender Sayings, in Prose and Verse, Selected from the Works of George Eliot, which was a huge success and went through numerous editions during Eliot’s lifetime and after. Mead’s account of her predecessor’s labors and his "assumption of intimacy" with the great woman is at times rather sour, yet she writes, "I recognized in his enthusiasm for her works enough of my own admiration for her to feel an awkward fellowship with him." Though she doesn’t quite acknowledge it, that fellowship extends to the revolutionary assumption, once common but now long out of use, that we might have something to learn from the past. You won’t find much original wisdom in this volume, any more than you would have done in Mr. Main’s, apart from what, with a bit more effort, you can get for yourself from Middlemarch or a straightforward biography of George Eliot. One exception is when Rebecca Mead observes that "a book may not tell us exactly how to live our own lives, but our own lives can teach us how to read a book." Just so. Her own may not directly take on the academic correctors of the past, but it does suggest how we might live our lives so as to learn from it.